I didn’t enjoy reading the story, but I certainly appreciated it as a whole. Zola shows a realistic disconnect for people who struggle with a vision, and I felt like I was glancing at real lives between the pages of the novel. Zola’s own judgments come out through the story because he doesn’t appear to understand the new style of painting. To the omniscient narrator, Lantier’s paintings appear to be a mess of colors. They are ridiculous failures. It’s obvious that Lantier is aiming for some degree of symbolism when he depicts the naked woman in the center of all his paintings. Yet, Sandoz (the novelist in the story that represents Zola) finds it ridiculous and mourns for Lantier’s apparent insanity. The editor of the introduction indicated that Zola was not able to appreciate impressionism; his taste in art was rather immature as was evident in his art criticism essays of the day. Incidentally, Lantier’s first major painting is based on one by Eduard Manet, which was displayed in the Salon des Refuses as was Lantier’s in the novel. Seeing Manet’s painting helped me to understand the reasons behind the ridicule, not that the painting was bad but that the concept was bizarre for the era. But the similarities were only one reason to be offended. Zola’s premise seems to be that it is hopeless to try to capture the world in art and create something original. Truly, artists of the day would have been slighted by such a premise. Further, attempting to do so leaves one isolated from reality. In the novel, Lantier failed to develop any real human relationships. Christine tried to bring Lantier back to reality, yet the art always called and Lantier was doomed in the end, for without art he was nothing. Despite the hopelessness depicted in the novel, Zola’s friend Cezanne truly was an influential painter who began a new way of thinking about art: impressionism. I found it interesting that Zola’s counterpoint in the novel, the writer Pierre Sandoz, was not as doomed as Lantier the painter. Yet, Zola’s writing was apparently as cutting edge as Cezanne’s paintings: seeing the world in a new way. I didn’t enjoy reading Zola. The only parts that captured my full interest and attention were the moments when he meets and courts Christine. Throughout the book, I kept waiting for a tragedy to capture my emotions and help me feel fully engaged. Yet, even when mortal tragedy struck, it was told in a matter-of-fact way that left me completely emotionless. That was, I’m sure, Zola’s point. Life is not a romantic experience. It’s harsh: we each suffer and in the end, everyone lives with their own life and their own suffering. “And now, back to work!” a character says at the end of the novel (which is not a happy ending, I’ll warn you). Such is life. While I’m sure I’m a romantic girl at heart, I am glad I’ve experienced Zola. It truly did help me see the world in a new light. 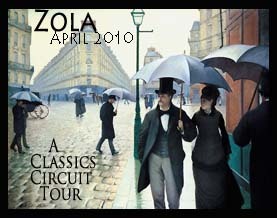 I read Zola as a part of the April Classics Circuit. See where Zola will visit here. Unsurprisingly, I think this book sounds absolutely wonderful. Germinal was by far the best book I’ve read all year and the best classic I’ve read in 2 years (I read about 60 in that time). I’m sort of frozen, wanting to read more Zola but scared it won’t live up to Germinal, but this one, Therese Raquin, Nana, and La Bete Humaine are all calling my name. I think he has potential to become one of my very favorite authors. But I connected with his writing on an intensely emotional level. There was so much passion in Germinal! I was so involved, far more involved than I wanted to be because I knew the book was going to end tragically. I wanted to stay separate, but I couldn’t. The writing and the characters were just so compelling! I’m sorry this didn’t work out for you, Rebecca. .-= Amanda´s last post on blog ..Germinal, by Emile Zola =-. Amanda, there was lots of emotion in it, but I still felt distance from it. Like I was watching action happen on a TV screen. One minute he’s yelling and the next he’s making love. OK, where is the romance, please? I’m just a fan of Jane Austen-esque romance, I’ve decided. That said, you’re review of Germinal has quite convinced me to give it a try. The more I think about it (and compare it to my current read…) the more I liked it in retrospect. I also like the premise of this book! I think Zola is one of those writers who has the ability to portray reality through his fiction in a way that is very truthful and honest. I have only read Germinal, but I was blown away by the realism and heartache of his writing. Perhaps this one just wasn’t the place to start? 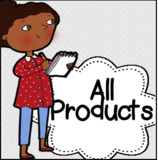 .-= Allie´s last post on blog ..Poetry Month. =-. Allie, see Amanda’s comment — I think Germinal is one I need to give a try! Lots of heartache in here, I see that. I just found it TOO REALISTIC for my romantic tendencies, I guess. Boo to me for reading it with the wrong frame of mind. I, too, am LOVING Germinal, much more than I anticipated – even though the 19th-century French & mining vocab is challenging, I’m still completely absorbed & only want to read Zola! .-= Emily´s last post on blog ..Essay Mondays: Cioran =-. Emily, I’ll say it again: SO IMPRESSED you’re reading in French. Good point. I did have a hard time feeling sorry for a painter who chooses to put his fist through the painting instead of trying to paint something that can feed his starving family. (or, I don’t know, maybe GET A JOB.) So maybe I need to give Germinal a try so I can actually pity the main characters…. Wonderful review! I’ve always wanted to read Zola, but have been somewhat intimidated. .-= rhapsodyinbooks´s last post on blog ..International Children’s Book Day =-. rhapsody, it sounds like Germinal is the place to start, because everyone so far has commented on how they love it!! Sorry you didn’t enjoy this, Rebecca. Therese Raquin was one of my favorites last year and I’m loving The Ladies’ Paradise right now, but The Masterpiece doesn’t really appeal to me. Zola is on the way to becoming a favorite… will turn to Nana or Germinal next. .-= JoAnn´s last post on blog ..Wuthering Heights Wednesday: Week 1 =-. JoAnn, actually, the more I think about it in retrospect, the more I really did like it. I can’t stop thinking about it and I finished it more than a week ago. I’m glad you enjoyed Terese Raquin. I need to find that one too. Oh, I was excited to read your thoughts about this after you hinted in one of your earlier weekly wrap ups that you weren’t thrilled with Zola. It’s interesting to read everyone’s different reactions. I guess I sort of knew how dark he was when I read Nana and The Masterpiece, but I never realized just how dark he can be. My tastes tend to fall on the medium-to-dark end of the scale, so I suppose I just forgot that this would be on the far dark end! What I found fascinating about The Masterpiece, though, was reading sort of an insider’s view about the art revolution of the time. And while Zola wasn’t thrilled with much of what he saw, I don’t think he necessarily thought that all art was hopelessly unable to capture life; I think he just thought that the way people were going about it was all wrong. There were a couple of artists whose lives were depicted in better terms–the one who was always slighted by the main group because his work was “too popular” and the writer. Both of those guys, even though they never suffered crazy agonies over “trying” to be unique/controversial/different, they both ended up doing good work and living happy(ier?) lives. I think he was just saying something about a certain artistic temperament and how it can be more damaging than anything. .-= Maire´s last post on blog ..The Minotaur by Barbara Vine =-. Maire, I think my tastes tend toward the brighter side, but I am still glad I read this. I completely believed how realistic it was: that’s what was so great about how it was written. I like happy endings, but this one was sure okay. And it certainly has been haunting me as I’ve thought about it for the past few weeks… Definitely a sign of success on the author’s part. I’m also a fan of Zola, but then I’ve had to teach his work to students in the past, and I generally found that when you had to get into an author enough to teach him or her, the best parts of the work rise to the surface and win you over. I really enjoyed The Masterpiece, because for me it was about how impossible it is to do something truly different in art and be understood. Consumers and critics alike have a deeply conventional vein, Zola seems to be suggesting, and they only like what they already know how to like. Impressionism was so wild and crazy and difficult when it first hit the art scene – no one wanted to know about it. The character of the writer has a much easier time because his form of realism (which was of course Zola’s own brand of naturalism) was a kind of zenith of all that had gone before. All of this was quite historically accurate – which was probably one reason why Cezanne never spoke to him again. The opposition between those characters, between the writer’s expansive, almost smug success, and the artist’s self-destructive and despairing failure, struck me as being quite plausible among arty types! What my students used to say about Zola is that he’s very cinematic. Lots of vivid visual description, like a camera panning a landscape, and he does this with his characters too, I think. You watch them like they’re in a movie rather than inhabit them as you would in some other kinds of narrative.That may explain why you felt distanced. I must say that Nana is my favourite Zola novel (though Germinal is very good). Or Therese Raquin is probably the most accessible, if you ever want to try again. .-= litlove´s last post on blog ..On Climate Change =-. I will try Zola again. So many love the other novels! Great review! It sounds like you felt as detached emotionally from The Masterpiece as I did from The Dream. I’ll admit I tend to be a romantic too, but I think the “realism” of naturalism can be just as unrealistic as romanticism, in the opposite direction. I think most people’s lives are a mixture of bad and good, sadness and happiness, and a lot of people do have happy endings. The idea that art somehow makes you lose your grasp on reality is something I hear repeated a lot by naturalist authors, and in my experience it’s just not true. I know plenty of artists, writers and readers, and I don’t know anybody who actually uses art or literature as more than a momentary escape. Frankly, I think most people need to be transported once in awhile, and that hope is a better inspiration to reach one’s goals than cynicism.